Zodiark is a writer from Newark, Delaware. He’s 20 years old and currently attends the University of Delaware. He’s always had a knack for writing but only just recently ventured into the weird and wondrous world of fiction. Taking on writing as a hobby came along when he was introduced to the furry fandom by a good friend in high school. Ever since then (give or take a few episodes of writer’s block), he’s been working on improving his art. 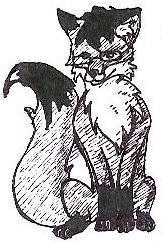 Zodiark has written one full-length novel entitled Chronicles of a Fox, although it is still being scrupulously edited. In addition, he has written a broad collection of short stories and poems, owing much inspiration to the Thursday Prompts of Renee Carter Hall. Of his works, four have so far been published by his university’s annual creative writing magazine (“The Experiment,” “Flight of the Raven,” “Lost and Found,” and “Here There Be Dragons”). He hopes to disseminate his works even further someday, but regardless of whether that dream comes true, writing has become a passion for him which will not soon disappear.